Aaah… I stopped reading at Pafuri border camp. Total bucket list item for me! Now I am going to continue reading. Congratulations! Wonderful photography and I am happy that you stopped by my blog! Now I can travel to South Africa and never buy a plane ticket! Ha Ha. No I would love to visit a country that beautiful! Welcome here at our blog, Robert, and we hope to welcome you to beautiful South Africa someday soon! Congrats on your 1000th post! May you have a thousand more!! Always enjoy your wildlife photography! Congratulations! You three and the blog deserve all the praise and accolades that come your way! Thanks for the most entertain and enlightening SA blog! Thanks for all the memories you stir in me… and the longing! May you retire one day with many thousand posts… and know then that Joubert and his family are keeping the good thing going! Net so by the way… ek dink ek weet hoekom die neushoring voëls hoog op die lys is! 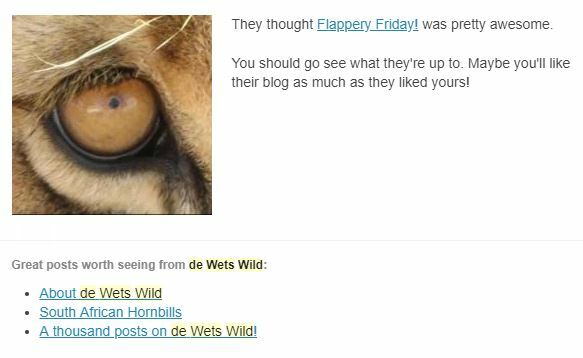 (En ek help ook…) WordPress se “Like” e-mails kom altyd in met drie opsies om op te klik… en, ek dink (judging by visits to my blog) dat WP die meeste besoeke as die opsies gee… ek hoop dit maak sin! Baie, baie dankie vir die gawe en warm woorde, AJ – ons weet jy bedoel dit opreg en waardeer dit ongelooflik baie! Baie dankie ook dat jy die “misterie” oor die neushoringvoels vir ons opgelos het! Congratulations for a very great blog! Congratulations! I always look forward to seeing your posts. I feel like we have something in common through reading them, even though we are many miles apart. Thank you very much, Siobhan – this blog has really been a great way to connect! Thank you so much for the ever positive contributions, Tina! Thank you so much for the kind words, Maamej! And your brother must have been a great guy! Baie geluk, dis lekker om te weet dat jy steeds sterk staan. Dis beslis n mylpal om te onthou. Ons waardeer jou ondersteuning opreg, Ineke! A great achievement and congrats. I love that you showcase creatures great and small, and plants and trees too, as well as sharing your travel experiences. I am sure you have plenty of material for your next 1000 posts! Thank you very much, Carol! The blogging experience has allowed us to connect with many others who love nature as much as we do, including you, and for that we are grateful! Eenduisend inskrywings, elkeen van 1000% gehalte – veels geluk! Thank you so much – we love what we do and hope it shows! Congratulations and kudos to all of you!! I loved seeing some photos of you, even though I obviously enjoy all the posts about animals, too. I look forward to reading your next 1,000 posts. You’ve been one of our friends since the very start, Janet – thank you so much! Baie geluk, de Wet. Julle is ń inspirasie vir my. Baie, baie dankie vir die gawe woorde, Una – ons waardeer dit regtig! Congrats! And keep up the posting! Thanks very, very much, Kathy! Wow – 1000! That is a major achievement! … and an even greater achievement is that each of your posts is one of quality. Educational, gorgeous photos, and yes, it makes me want to visit South Africa! Ah, then we’ve succeeded in our mission! Thank you very much for the kind words and the years of support, Joanne! Big congrats! Thank you for all your adventures shared! Thank you so much for your long-standing friendship, Ann-Christine! You’ve quickly become such a wonderful friend of de Wets Wild, John. Thank you so much for all your kind and encouraging words, it really means a lot to us! You are very kind John, thank you! Well done de Wets! Your blog has a wealth of information and is a good resource from wildlife destinations to any number of birds, mammals and ecology, environment!!! That Hornbill post is remarkable for having so many of the species. Must say I’m green with envy at the list of so many of SA’s finest wildlife destinations 🤢. Keep up the good work – you rock!!! Wonderful to be sharing our love for SA’s natural heritage with likeminded nature buffs like you, Liz! Thanks for all the thoughtful contributions to our blog! Well done! Your posts are always an enjoyable read. Very kind of you to say, thanks Anne! Fantasties en baie geluk, Dries! Julle blog is puik en ek probeer om nooit ‘n inskrywings ng te mis nie. Ek hoop ek kan nog lank hier lees! Nog altyd een van ons gaafste en vrygewigste ondersteuners – dankie, Dina! Thanks a lot! Glad to know those beautiful animals brighten your day so! Congratulations to you! I was hoping the rhinos and elephants made the favorites list. Baby rhino is right there!! So cute. Thanks very much for all the support year in and year out, Lois! Congratulations!! I see some of my favorite posts there! Wonderful job!! Thanks so very much, Miriam! You’re very welcome. Thank you for all the posts! Congratulations. Having only just found your blog I do hope you keep going for a bit longer yet. Very inspiring. We’re planning on being on the block for a while, Tracy, and thanks for being so supportive! Congratulations on reaching 1000 posts! I truly enjoy your blog and appreciate your kind comments on my posts. Thank you so much for years of support, Deb! Congratulations! Happy 1000th post, we need many more! Congratulations on reaching the 1000 post milestone!